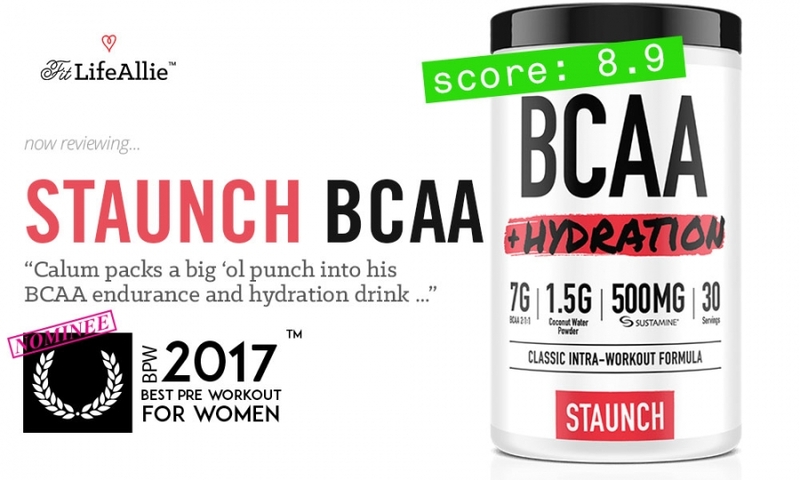 Staunch BCAA Hydration Review: I Test Calum's 2nd Product. Mister Calum Von Moger would certainly be happy that I’m doing my SECOND Staunch Nation supplement review- this one on the brand new Staunch BCAA + Hydration product. In this Staunch review, I’m going to do a handful of things. A big, Calum Von Moger hand, at that. So that’s a big hand. And I can only imagine what he can do with those big hands. If ya know what I mean. Oh dear. I’m already off on the wrong foot in the Staunch Supplements BCAA + Hydration review. Sigh. I suppose Calum just has that effect on me. I should probably cool my jets before the lovely Miss Karina Elle comes after me though! She’s such a babe. I’m jealous. But I love her. Okay. Let’s TRY and stay on track, Allie. In this Staunch BCAA review, I’ll talk about the flavors (I tried both), the formula, the packaging, and of course wrap things up with a value grade, which takes everything into account. So. Are you ready for this? Let’s jump in. Just like Calum jumps into the pool, in the absolutely ridiculous Facebook Ad that I saw. LOL. If you haven’t seen it, there’s a total babe who walks into a pool, and then Calum comes along and does an enormous cannonball in her face. Signature Calum humor. He thinks he’s SO funny. Lol. But anyways- there’s a good chance you saw that same ad, and now you want to know. Are these BCAAs actually worth the money? ‘Cause it’s $34 per tub. You really want to get your money’s worth, don’t you? We all do. Let’s start with a flavor review of Staunch BCAA + Hydration. What’s the Best Flavor of Staunch BCAA? But really, do these BCAA’s from Mister Calum taste good? In my opinion, they kind of DO. They aren’t the BEST tasting BCAA’s I’ve ever had in my life, but you know what? They’re pretty dang good. I tried the Strawberry Coconut and the White Grape. And the BEST flavor of Staunch BCAA + Hydration is the Strawberry Coconut. Strawberry Coconut: This flavor of BCAAs was the best to me, because it had a really nice Summery taste that I enjoyed on the day that I tried them. It was like 94 degrees with FULL humidity in Cleveland when I tried the Staunch BCAA’s so you can imaging I wanted to be refreshed. And I actually was. I found the Strawberry to have the nice Summery notes that I wanted. I loved the notes that I got. Just a hint of coconut and plenty of fresh (and artificial) strawberry. White Grape: If the Strawberry Coconut Calum Von Moger BCAAs are an 8.8, than the White Grape is like an 8.5. I like the White Grape, but they don’t have the same degree of sophistication as the Strawberry coconut. Overall I found Staunch BCAA + Hydration to be drinkable, but not crave-able. Let’s move into the formula. What’s in Staunch Supplements BCAA? What’s in them indeed? You guessed it. Branch Chained Amino Acids. All three of them. This product has quite a bit of them. Staunch has SEVEN grams of BCAAs per serving. That is quite a bit. It is more than all of the other BCAAs that I have reviewed that’s for sure. In fact, it has the same BCAA content of nearly three servings of Fitmiss BCAAs. Lol. But that product is garbage. This one is awesome. And it’s awesome because it has not only BCAAs but also coconut powder for a natural source of electrolytes, and even something called Sustamine- which is a patented endurance ingredient. I enjoy it greatly. In fact this is one of the only BCAA products that I think I can actually FEEL working. I have had absolutely fantastic workouts with Staunch BCAA and I think it’s because it really does have a solid formulation. I give it a 9/10 on the formulation and supplement facts. So the formula and flavors are quite good. How about the packaging? Staunch BCAAs Don’t Look as Cool as the Koala Freak Pre Workout. I have been following Calum’s fledgling supplement company for several years now. I think the BCAAs are a bit of a step backwards in terms of packaging for Calum and the Staunch Supplements Team. I think Koala Freak Pre Workout set the bar so high with it’s bright colors and fun Koala graphics that BCAA + Hydration probably was never going to measure up. But. What can you do. BCAA’s are a little bit of a more boring product anyways so it’s not that surprising that Staunch BCAAs have a more subdued graphics package. It sort of matches the product. It’s a white label with a very text-heavy graphics package. The word ‘hydration’ has a color splash behind it, and the quantities of the key ingredients sit beneath. It could benefit from a little bit of relief in the form of graphics, but, again, it’s altogether not unpleasant (awful sentence structure there, I know). Okay. Let’s wrap this up.